What Did the Dow Do Today? Subject: What Did the Dow Do Today? What Did the Dow, S&P 500, Nasdaq Do Today? The DJIA today gained 180 points and the Nasdaq hit a 15-year high as traders showed some optimism over Greece and cheered news that the U.S. Federal Reserve will wait until later this year to raise interest rates. Tech giant Microsoft Corp. (Nasdaq: MSFT) offered the biggest boost to the Nasdaq and the S&P 500, rising 1.6% on the day. 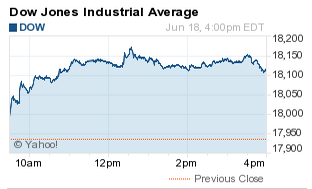 The Dow's best performer today was 3M (NYSE: MMM), which added 1.6% on the day. The S&P 500 Volatility Index (VIX), the market's fear gauge, slumped more than 8%. What Moved the Dow Today: All 30 Dow components rose Thursday as investors were optimistic on news that the Federal Reserve will delay raising rates until later this year. News of potential economic reform in Greece also added a boost to confidence. Greek Finance Minister Yanis Varoufakis pitched a handful of new reform proposals to creditors this afternoon in a meeting in Luxembourg. What Oil Did Today: WTI oil pricesslipped 0.1% after the Energy Information Administration reported that gasoline inventories and crude stockpiles increased at Oklahoma delivery hubs. Meanwhile, Brent oil gained 0.3% to hit $63.87 per barrel. On Tap Tomorrow: On Friday, investors will weigh the comments of two Federal Reserve members and await an important earnings report from Darden Restaurants Inc. (NYSE: DRI). Companies reporting earnings Friday morning include Carmax Inc. (NYSE: KMX) and KB Home (NYSE: KBH). Stocks to Watch No. 1, FIT: Shares of Fitbit Inc. (NYSE: FIT) surged more than 50% during FIT's debut on the New York Stock Exchange. The company's IPO per-share price was $20, far above its expected range. The company's valuation topped $4.1 billion. Now the key question for investors: Is Fitbit stock a buy? Find out here. Stocks to Watch No. 2, HOG: Shares of Harley-Davidson Inc. (NYSE: HOG) gained 4.1% on news that UBS Group AG (NYSE: UBS) upgraded the motorcycle maker's stock and boosted its price target from $50 to $63. Stocks to Watch No. 3, RAD: Shares of Rite Aid Corp. (NYSE: RAD) slipped more than 3.7% after the company reported weaker than expected first-quarter earnings. The news was surprising given that the health and wellness retailer has undergone a rather successful turnaround in the last year, fueled by a boost in prescription sales. The company said that same-store sales fell for the quarter and announced it has slashed its forward guidance for the second quarter on rising costs in May. The company is one to watch in the coming months as many analysts see Rite Aid as a strong takeover candidate for either of its larger two competitors Walgreens Boots Alliance Inc. (NYSE: WBA) or CVS Health Corp. (NYSE: CVS). Stocks to Watch No. 4, ORCL: Shares of Oracle Corp. (Nasdaq: ORCL) dropped more than 4.8% after the company reported weaker than expected fiscal fourth-quarter earnings after the bell yesterday and said that a stronger dollar hurt its bottom line. The tech giant said it continues to see strong growth in its cloud-based products division.